Trigger finger, also called Stenosing Tenosynovitis is a common condition affecting the fingers. The tendons that bend the fingers (the flexor tendons) glide through a tunnel made of pulleys. Triggering happens when the space in the flexor tunnel is narrowed and the flexor tendon catches on one of the pulleys. A vicious cycle is then formed as the more friction there is on the tendon, the thicker the covering of the tendon becomes (synovium), until it forms a distinct swelling that gets caught in of the pulley. Initially the fingers may be painful to bend, but as it progresses they may start clicking or even lock into a bent position and unable to be straightened. Often the symptoms are worse in the morning or after excessive use of the fingers. Mild triggering is usually managed by non-surgical means initially. Some of these include splinting, steroid injection into the pulley, anti-inflammatory medication and activity modification. Moderate to severe triggering usually requires surgery (trigger release). This is done by an incision in the palm and dividing the first pulley (A1 pulley) to allow unimpeded glide of the flexor tendons. Occasionally, the tissues around the tendons may need to also be excised (synovectomy). Hand Surgery is one of Dr Safvat’s interest and area of expertise. 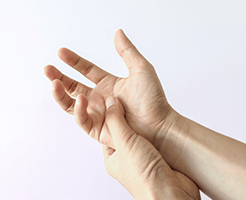 Trigger finger release is performed in an accredited hospital, usually under a short general anaesthetic but can also be done under local anaesthetic. The procedure is done as a day only procedure without the need to stay overnight in hospital. The hand is wrapped in a bandage but it is encouraged that the finger is moved immediately after surgery. The dressing is removed about 1-2 weeks after surgery and patient often resume their usual work capability within 2-3 weeks.